It is hot everywhere right now, but you will simply have to resist the call of the swimming pool in your garden, or the beach, to focus on your garden! It is time to take soft cuttings, sow a first crop of winter vegetables and winter- and spring-flowering annuals in trays in most regions. 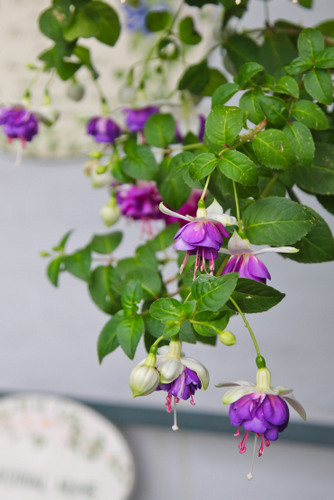 Fuchsias need to be kept cool and well watered to get them through summer. Regularly check for red spider mites. Keep roses well watered, feed them and spray weekly against pests and diseases. Prune evergreen hedges to keep them in shape and give lavenders a light trim to neaten them. Deadhead annuals and perennials so that they keep on flowering. Cut back herbs to encourage fresh new growth. Freeze or dry the snippets of summer herbs for use during winter. Bunches of herbs can also be used as insect repellents in your home. Mints deter most insects, including ants. Basil, rosemary and lavender keep flies at bay. Lemon-scented herbs such as balm, lemon grass and scented geraniums are great for keeping mosquitoes away. Tansy is good as a flea repellent. Pinch out tomatoes and surplus squashes to get fewer but bigger vegetables. Feed fruiting plants such as peppers, tomatoes, eggplants and cucumbers to ensure a good crop. Sow spinach, globe artichokes, chillies, parsley, carrots, radish and rocket. Do not garden without sunblock, a hat and a bottle of water close by! Keep azaleas and camellias well watered to ensure a good show of flowers in winter and spring. To promote lots of blooms feed with 5:1:5 or 3:1:5. Mulch with bark chips to create an acid medium. Sweet peas can be sown now. Prepare a trench with well-rotted kraal manure and add a lot of compost, bonemeal and an organic fertiliser to the soil. 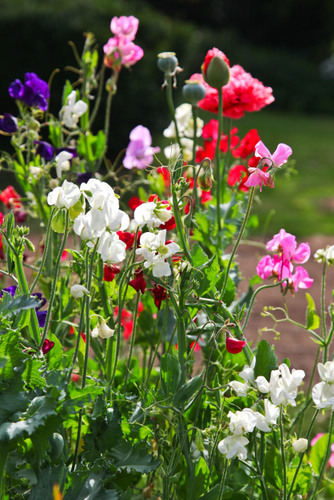 The key to success with sweet peas is enriched and well-draining soil. Soak the seeds overnight in warm water before sowing directly in the trench. Do not allow your lawn to become too long and then mow too short, exposing its roots to the sun. Rather mow more frequently with the blades set on high. Water deeply once a week if it has not rained and feed with a balanced fertiliser to keep it lush and actively growing. Look out for mole crickets, ants and harvester termites. Do not be tempted to plant winter annuals too early as the seedlings dislike the heat. If you are short on colour, rather plant another batch of petunias, marigolds or vincas. You can start sowing those winter- and spring-flowering jewels, which need a bit of time to grow up in seedling trays. They are cinerarias, gazanias, Iceland poppies, primulas, violas, pansies, larkspurs, Canterbury bells, columbines, sweet Williams and aquilegias. If the heat is too much for you out there in the garden, replant your containers with permanent focal plants. 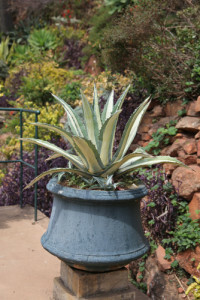 Nurseries are now filled with beauties like agaves, tree aloes, Japanese cycads, flaxes and cordylines. In the veggie garden, plant another batch of bush beans to get one last harvest before winter. Go for classical combinations by adding ornamentals into you herb garden or vice versa. Variegated lemon thyme with Euphorbia ‘Diamond Frost’ and Salvia farinacea ‘Victoria Blue’ are stunning together. Or use green and purple perennial basils interplanted with wild garlic (Tulbaghia violacea) and miniature blue agapanthus together. While enduring the heat of February, think indigenous and tough, so plant more buddleja, plumbago and freylinia. Use Carissa ‘Green Carpet’ for low hedging and know that you can always rely on geranium and arctotis for colour. 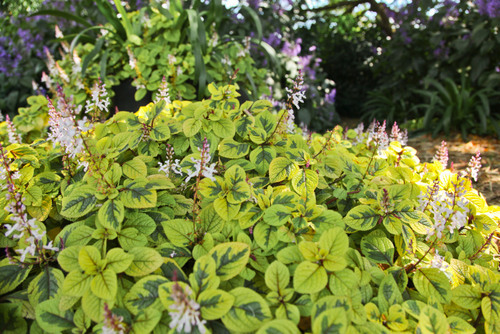 Fill gaps in shady areas with bright and beautiful Plectranthus ciliates ‘Sasha’. Wood termites will be active, so give them a good drenching with an organic insecticide. 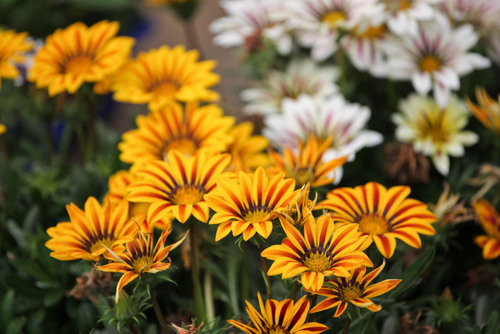 Tough annuals like dianthus and gazanias will fill the gaps and provide colour for the months ahead. Also add day lilies and some of the latest new releases on the agapanthus front with purple, deep blue, and bi-coloured blooms. To add more glamour to your garden plant Trachelospermum ‘Summer Sunset’ (a lovely variegated star jasmine with glowing foliage colours) and the Alstroemeria Inticancha range of compact Inca lilies in glowing new colours. Veggie gardeners can now establish berries like raspberries, blackberries, blueberries and even a pomegranate or two for future bountiful harvests. Feed tropical fruit like litchis, pawpaws and pineapples with 3:1:5 SR fertiliser. Every garden should have a lemon tree. The variety ‘Eureka’ is highly recommended – a generous, smooth skin variety that is also suitable for growing in containers. Do not let any weeds go to seed – you and your back will regret it later! 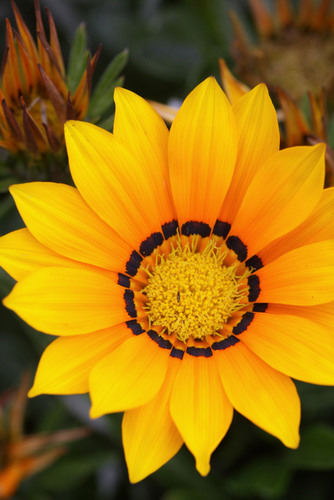 Many summer-flowering annuals start coming to the end of their flowering season and need to be removed. So, collect ripe seed of flowers that you wish to grow for next season and start preparing seed and flower beds for autumn planting. Apply a general fertiliser to the whole garden, especially around larger shrubs that often make an autumn growth spurt. 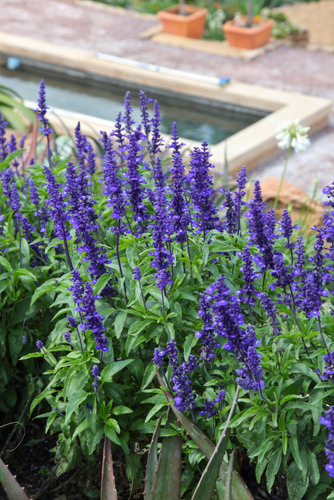 Perennial salvias thrive in the heat and will soon make a spectacular autumn display. Make sure they are fed to give their best! Prune summer-flowering rambling and climbing roses. Take cuttings of soft-wooded herbs and shrubs. Check pumpkins, marrows and cucumbers for mildew – raising them off the ground also prevents rotting. Sow early crops of peas and broad beans in the cooler climates. Continue sowing regular crops of quick herbs like coriander and rocket. Nuts (pecans, walnuts and chestnuts) start falling and need to be collected or harvested. Continue disposing of fruit that has fallen on the ground by burying it. If you have planted lots of petunias, cut them back to encourage a late autumn flush. 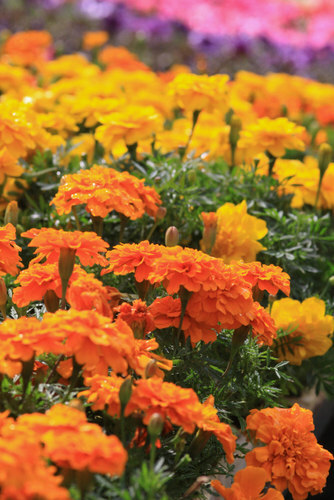 Replace other tired bedding plants with marigolds, vincas, salvias and portulacas, also adding splashes of quick joy like verbenas – they all like it hot! More beauties to make your heart stop are Plumbago auriculata ‘Cape Dark Blue, which you can combine with Tecoma capensis ‘Apricot’ (Cape honeysuckle). Quite a few erica’s are in flower, as well as indigenous salvias like Salvia chamelaeagnea ‘Blue’. If you are a succulent collector, check out all the stunning crassulas, which are looking their best right now! Herbs and veggies to plant and sow include cauliflower, celery, cabbages, oriental vegetables, sweet basil, coriander, nasturtiums and flat-leaf parsley. Plant more bush beans, onions, spinach, lettuce, carrots, beetroot and Swiss chard. Feed deciduous fruit trees once the harvest is over and renew the mulch around their roots.